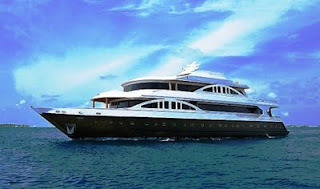 The 129ft Motor Yacht Orion has arrived and is available for Charter in the Maldives year round. Launched in 2009, the 129ft safari style Motor Yacht Orion is considered one of the most luxurious charters available in the Maldives year round. Fully equipped with facilities for diving and fishing plus an attentive crew of 13 who can combine local knowledge, expertise, experienced instruction and attentive service. She offers luxurious accommodation for up to 22 guests in 13 cabins, so she is ideal for a large family, groups of friends or corporate event. There are 1 x Master Suite with private ensuite with bath tub and a private external area including a private 2-person Jacuzzi; 1 x Junior Suite with a Queen Bed plus an extra day bed and ensuite with bathtub; 6 x Queen Size Cabins with private ensuites with showers; 2 x single cabins with ensuites with showers and 3 x Twin Rooms with ensuites with showers. All cabins are equipped with minibar, digital safe, Plasma TV and DVD player. Relax on board the ORION's deck jacuzzi or inside the luxurious spa with it's sauna and massage facilities. Also enjoy yoga on the sundeck. We set cruise through the Maldives Archipelago to visit untouched and idyllic islands and unspoiled dive locations unaffected by tourism and exploring the underwater pleasures of the Maldives. Maldives diving information: With a formation of 19 Atolls consisting of outer & inner reefs The Maldives is the most diverse diving destination in the world. Amazing channel dives draws granduous animals of the deep, adding to a diversity of marine life which will leave you spellbound. Mountainous pinnacles (thila) rise from 35m and tapper to 8m, which make them ideal for those slower, more relaxing dives. The average water temperature is 27C and current can be strong at about 1.5 knots ideal for shark and manta ray encounters. So fasten your seatbelts and glide into the blue for the most awe-inspiring experience of your life. The Maldives, warm and fascinating, provides the richest Marine life with coral reefs sprouting with activity and visited by schools of fish. Playful dolphins drawing close to boats are a popular sight when you take the plunge into the enchanting waters of The Maldives. For more photos and information.